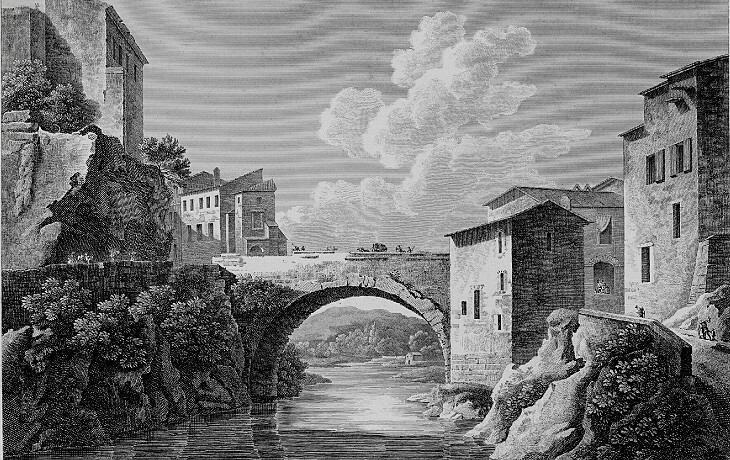 The Roman Bridge in a plate from "Alexandre de Laborde - The Monuments of France Chronologically Classified - 1816-1836"
At Vaison 15 m NE of Orange are some scanty ancient remains: 2 arches of a theatre and a Roman bridge of a single arch over the torrent l'Ouvèze beyond which in the modern town are 2 old Romanesque churches: St Quinin partly of the 8th century and the cathedral calculated to interest the antiquarian architect. The book written by Laborde was a sort of UNESCO World Heritage List of the monuments of France. 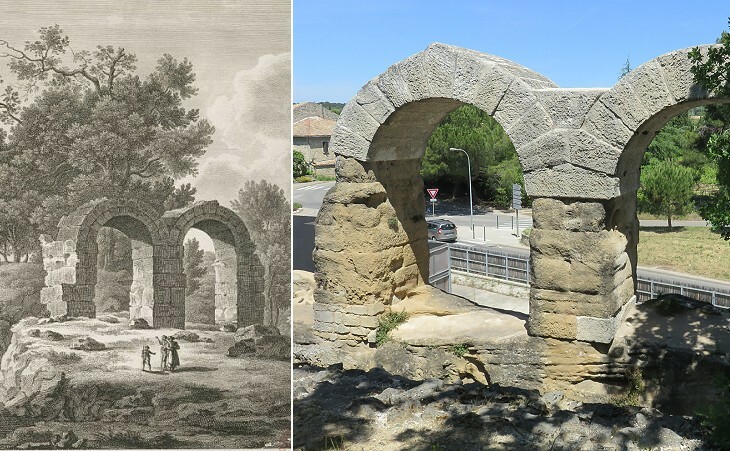 Thanks to it the public knew about the ancient monuments of Vaison (Vasio), a small town which had been totally ignored by Grand Tour travellers until then, although it was close to Orange and Avignon which they all visited. 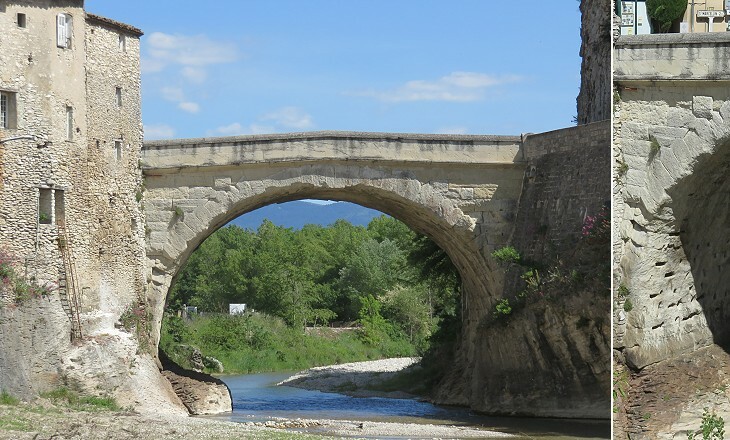 The bridge is dated Ist century AD and its solidity was tested in 1992 when it withstood a major flood which destroyed its parapets and caused the collapse of other bridges in the region. Vocontiorum civitatis foederatae duo capita (sunt) Vasio et Lucus Augusti (Luc-en-Diois, which was eventually damaged by a landslide). Pliny the Elder - Historia Naturalis - Book III. The sentence by Pliny indicates that the Voconci, a Gallic tribe, were regarded as allies by the Romans and that they formed a civitas, a legally recognized community run by its own institutions with two capital cities. 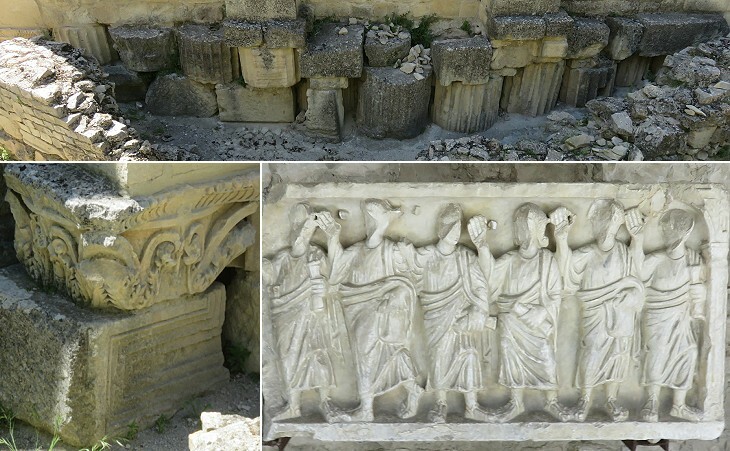 During the XIXth century some statues and reliefs which were found at Vaison were moved to Avignon (see page two) or bought by antiquaries, but no systematic archaeological campaigns were carried out to unearth the ancient town. In 1907 Joseph Sautel, a priest and professor at Avignon, undertook the first excavations at his own expense. The findings were so interesting that in 1913 the State decided to support him. 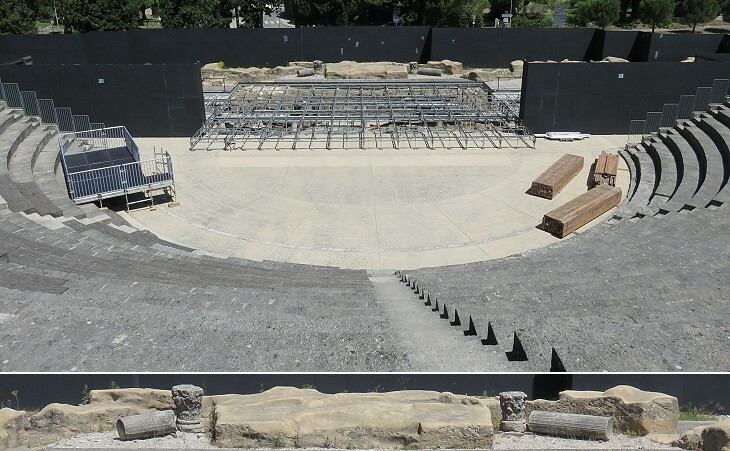 On the basis of statues of emperors which were found at the site, archaeologists suggest that the theatre was built at the time of Emperor Claudius by partially excavating a hill and that its facilities were improved by his successors. 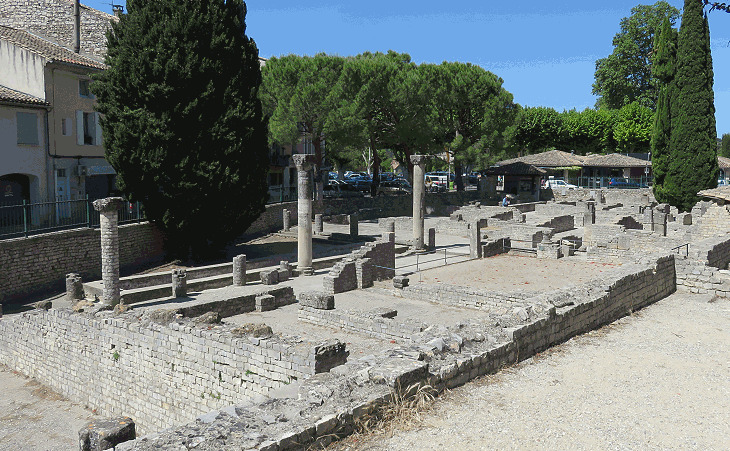 It is the only large monument of Vasio which is currently visible; the location of the Forum and of an amphitheatre were recently identified in the course of excavations for the construction of new buildings. 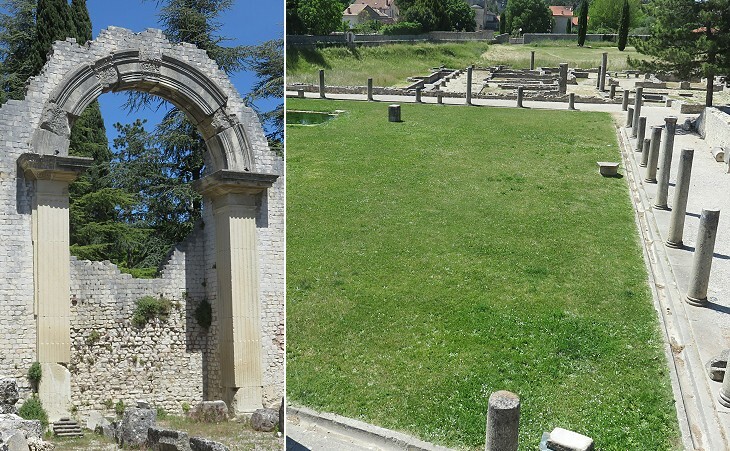 The archaeological campaign which excavated the theatre was enlarged to include a neighbourhood (Puymin) which was at a distance from the centre of the Roman town. 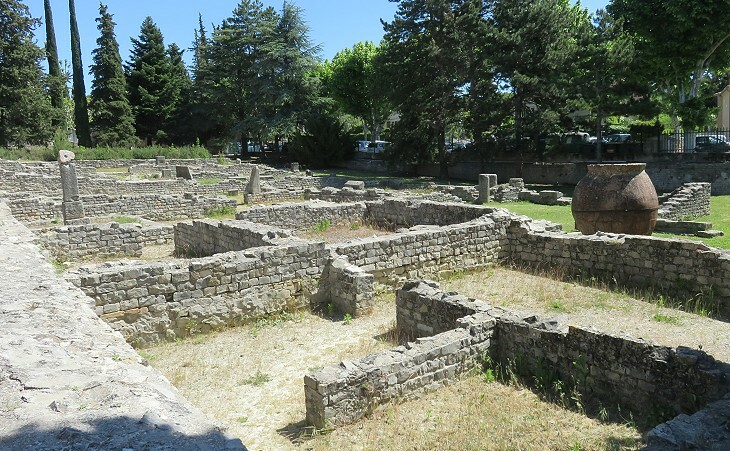 Vasio was not a town founded by the Romans for the Voconci (unlike Augustodunum which they built for the Aedui) and therefore its aspect was a mix of new buildings/facilities having a Roman layout and pre-existing ones. This explains why the House of Apollo, a typical Roman domus stood next to workshops and rural facilities. This rich house is dated late Ist or early IInd century AD; it stood on relatively high ground which meant it was easily visible from the centre of the town. The location was most likely chosen on purpose because the house belonged to Lucius Messius, a rich landowner who is celebrated as donor/patron in a fine inscription. 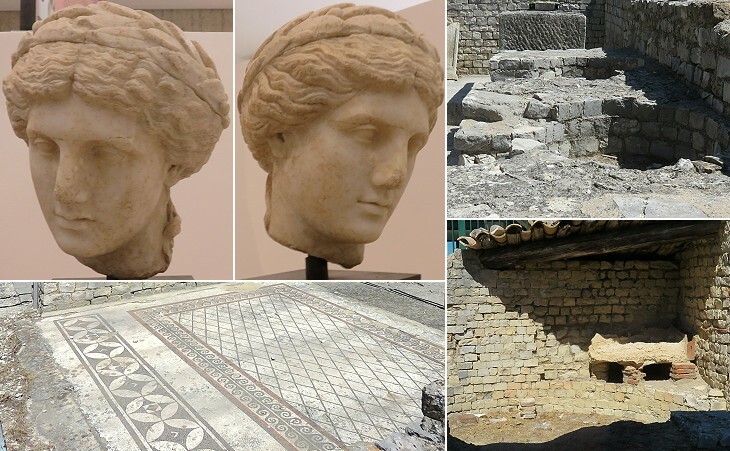 He had acquired Roman citizenship and the layout, facilities and decoration of his house were meant to show his status in the Romanized upper class of Vasio. Higher up on the hill of Puymin archaeologists found a very large complex on a series of terraces which originated from a farm. It was not redesigned, but in the IInd century AD some improvements were introduced in a section reserved to the landlords. It is named after an open air dining room in a large courtyard which archaeologists believe was sheltered by a pergola. The Puymin Archaeological Area includes a manufacturing/trading neighbourhood with a row of small workshops and warehouses. Here archaeologists found a large dolium, a jar which was almost entirely buried in the ground to maintain its contents at a constant temperature. It was used to store olives/grains or olive oil/wine, similar to what was done on a larger scale at Ostia. 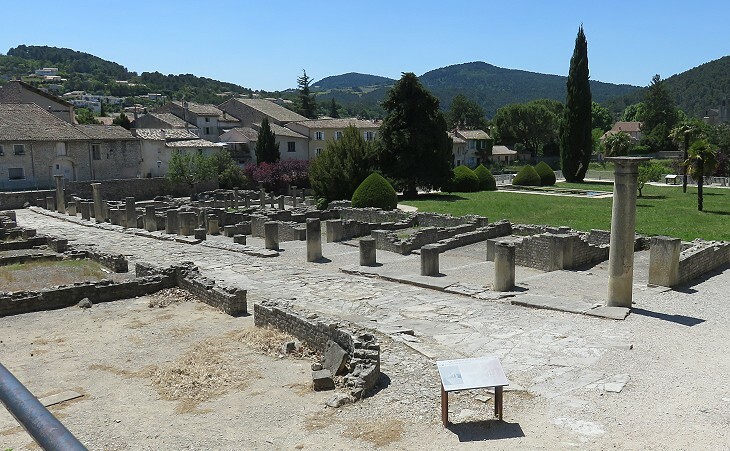 The economy of the Roman town was based on agriculture and this applies also to the modern one: The land around Vaison-la-Romaine offers a whole symphony of flavours, aromas and colours. A varied range of locally-grown, high-quality agricultural produce enhances the local gastronomy. From the City website. The inhabitants of Vasio on their road to the theatre perhaps had a leisure walk in a large square portico before attending the performance. Its purpose is still to be fully understood. It has a niche which most likely housed a large statue. It could have been an additional forum dedicated to a deified emperor. Joseph Sautel began his excavations in this area which was close to the centre of the ancient town. Here the orderly layout of buildings and the presence of colonnaded streets indicates that an effort was made, most likely during rule of the Flavian emperors, to emphasize the Roman character of the town. 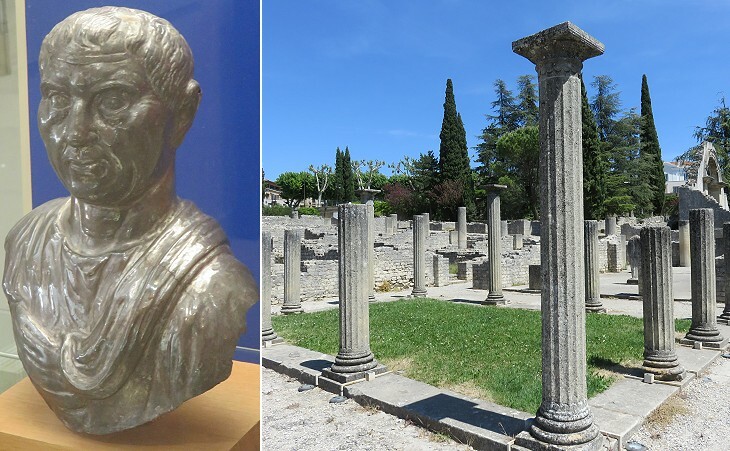 The finding of a fine bust of the early IIIrd century AD was influential in the decision by municipal authorities to add la-Romaine to the name of the town. Today the bust is no longer regarded as that of a landlord, but rather of an important member of a religious college (maybe of the local Augustales) or of a guild. This because the building does not have the layout/facilities of a house. A house at the edge of this archaeological area retains in situ its mosaic and fresco decoration (the mosaics of other houses were moved to the local museum). 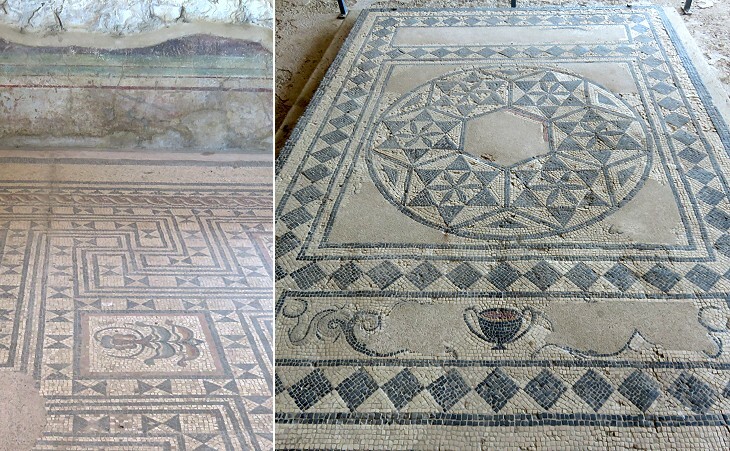 The mosaics are mainly black and white in line with the Roman usage (similar to what occurred at Vienne) with a limited use of colour which suggests that they were made or partially modified in the early IInd century AD. 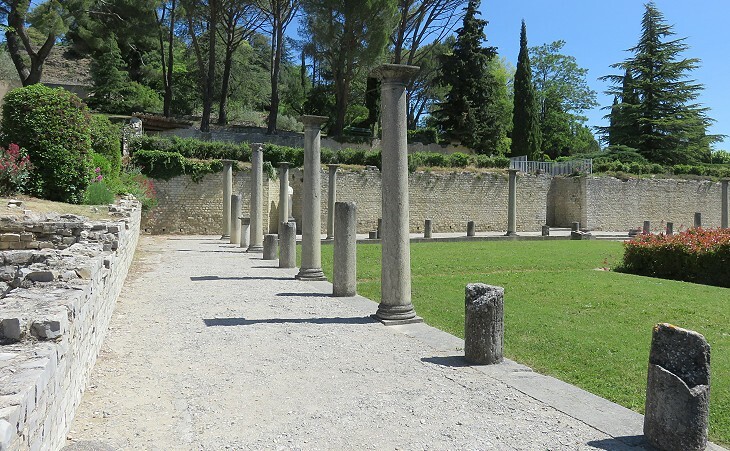 This archaeological area had facilities where those who spent the day in the nearby tribunals and basilicas of the Forum could relax. Two bath establishments have been identified; one of them was adjoined by a large palaestra where its customers could exercise. Laborde included this building among the Roman monuments of Vaison. He wrote that it was referred to as the Temple of Diana without any evidence. He thought it had been built at the very end of the Roman rule although he admitted that the pilasters and the reliefs were too well executed for having been made in a period of decadence. Eventually Sautel demonstrated that it was entirely built in the XIIth century; it shows how much Romanesque art is indebted to the Roman one, especially in terms of architectural elements. 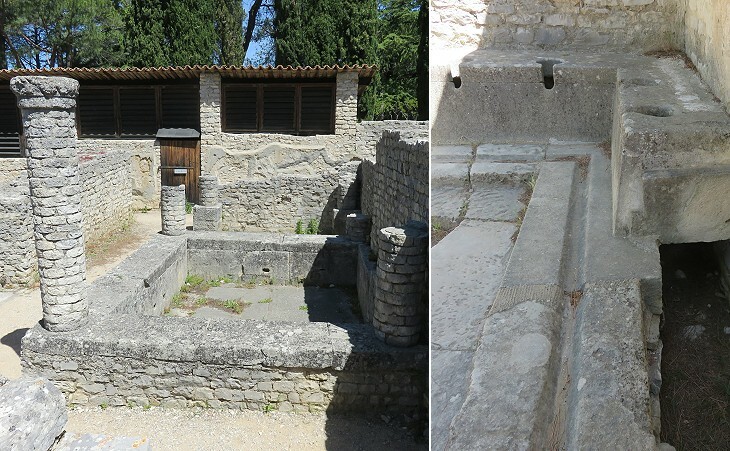 After the fall of the Western Roman Empire in the Vth century Vaison retained some of its former importance and there are records indicating that in 529 a local council was summoned there by Saint Caesarius of Arles, Archbishop of that town. 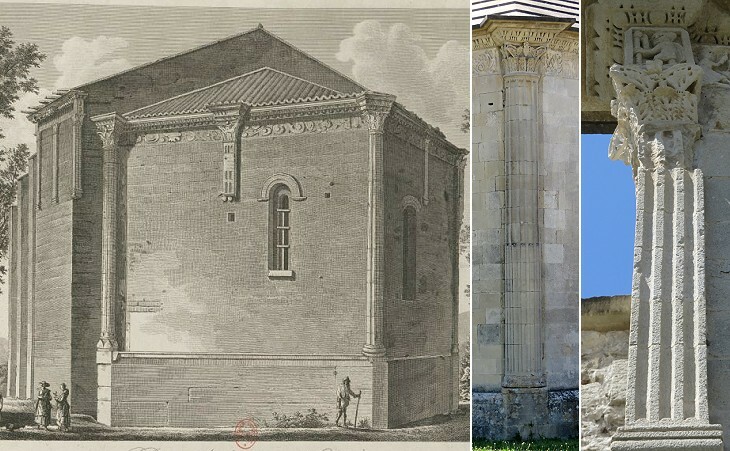 A cathedral was built using ancient materials. 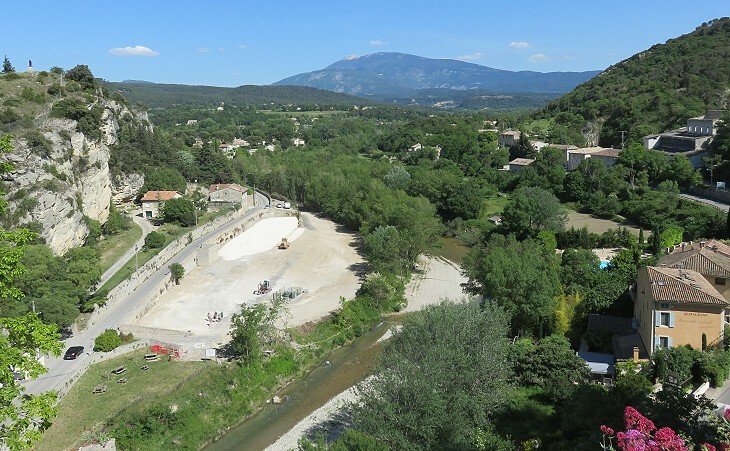 The population of Vaison grouped around it until the XIIIth century when for security reasons the few inhabitants chose to move to the hill on the other side of the river, which was protected by a castle. 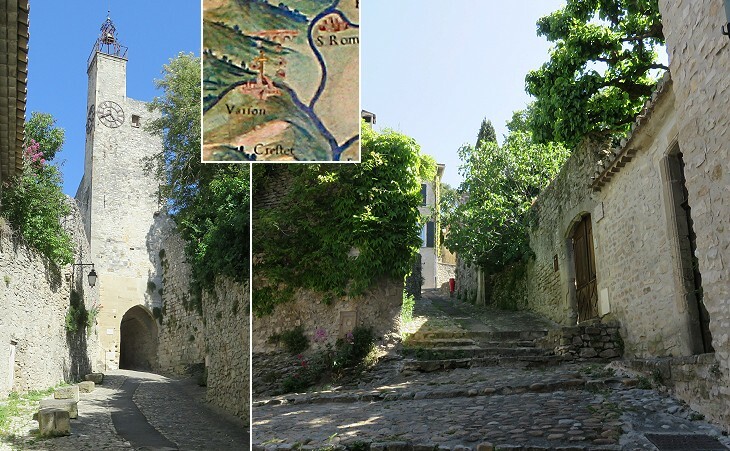 The move to the Upper Town occurred shortly after the Popes had acquired the property of Comtat Venaissin, the region between Mount Ventoux and the left bank of the River Rhône which included Vaison. In the late XVIIIth century the inhabitants began to move back to the old town and now very few of them live in the Upper Town. Vaison remained a Papal possession until 1791 and a Bishopric See until 1801. Move to Exhibits in the Museums.